LabEquipmentsManufacturersIndia is a leading industrial trainer manufacturers, suppliers & exporters in India. Our industrial trainer are made of premium quality raw materials tested by our lab experts on several parameters. 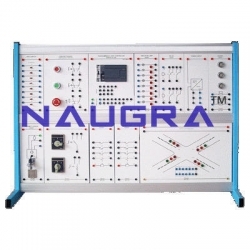 Our industrial trainer are used in various engineering schools, colleges, universities, small & big industries, vocational training centers, testing & research labs across the globe. Some of our Industrial Trainers are CNC Machine Lab, Cement & Concrete Testing Equipments, Analytical Lab Instruments, Masonry Workshop Tools, Plumbing Workshop Equipments, Measuring Tools & Equipments etc.